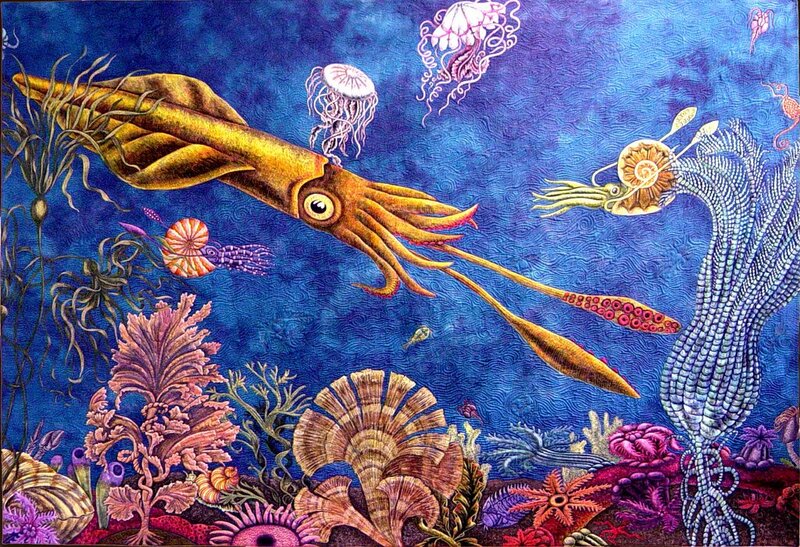 Primordial Sea won 2nd place in the Painted Surface category at the International Quilt Festival! I love going to Houston each year and seeing all my old quilt pals from Austin, as well as all the other friends I have met over the years. And I love meeting new people that I may have an aquaintance with online but have never met in person. It's pretty fun seeing all the quilts too. I am new to the web ring, but wanted to say congratulations on your win at Houston. I also had a quilt in the show, but it didn't win anything. I think I probably entered it in the wrong catagory, because the winners I thought were very consertavice. I thought Innovative Applique would mean that you did something different in techniques. It is called Free at Last, and you can see it on my Serindipity site. I hated not being able to go this year. In looking over your blog, I am thrilled that you give out so much information and love the things you are working on. are working on. I will visit it often so keep it coming. It turned out gorgeous, and was great to see in person. Wow. and Wow again. I so wish I could be in Houston to see this and the other winners 'in person'. But what I really wanted to say--I just love your quilt from '02, Graven Images. Coincidentally, I did a tombstone quilt that year also, & recognised lots of the imagery. It's a spectacular piece and probably my favorite from that year. Naomi from upstate NY on Quiltart. Judy, I saw your Primordial Sea at Houston. It was deserving of the award and I am very happy for you. Congratulations again. Awesome work!